The 40th National Convention on November 13-15, 2014 at ICR, Legazpi City, Albay. 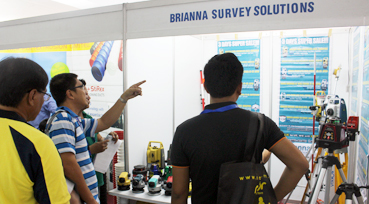 This was the first time TEAM BRIANNA has joined the Biggest Event for the Philippine Civil Engineers. As usual, we offered three (3) day super sale has been successful. We then offered 10 % to 30 % discounts on all items. To add more excitement, we further offered additional accessories for any purchase such extra total station battery, extra prism and pole, extra mini prism and others. We sold Portable Measuring Wheels, Heavy duty Measuring Wheels, Handheld GPS, Prisms, Mini Prism and other accessories. We received requirement from the DAR, DPWH, Municipal offices, Provincial Offices, State Universities and other government agencies. The event has been a success. We met new friends from different parts of the Philippines.